Before considering how stars die it is worth considering how stars are born. How do we know what stage a star has reached in its life? The answer comes from a detailed theory of star life, which is based on the laws of physics. This theory of "stellar evolution" is one of the great achievements of science in the 20th century. The first question to ask is, ‘what is a star’ ? A star is just a cloud of gas. Stars are born from the tenuous gas which fills the whole of space. This gas is composed mainly of hydrogen atoms, with a sprinkling of helium and some dust. In some places, the gas is disturbed by nearby stars and clumps together in rather more dense interstellar gas clouds. According to gravitational theory, the gas cloud's own gravity makes it attract itself. This causes the gas to pull it n on itself, compressing the cloud to ever higher densities. The centre of the cloud becomes the most compressed region. Here, astronomers expect some of the gas to condense into individual blobs, each held together by its own gravity. When a gas is compressed, it becomes hotter. So, the temperature at the centre of each blob rises to 10 million degrees Celsius hot enough to start nuclear reactions. These reactions turn hydrogen to helium and create vast amounts of energy. As a result, the blob begins to shine: a star is born. Using infrared telescopes astronomers have found that the blobs of gas collapse in rather an odd way. The central parts of a blob fall inwards rather quickly, while the outer parts follow at a more leisurely rate. The blobs are also rotating, quite slowly, but as the outer parts fall inwards, they begin to spin more rapidly-just as ice-skaters spin more quickly when they draw in their arms. As a result, the in falling gas forms a disc around the newly born star at the centre, where the gas is compressed enough for nuclear reactions to start. Within this disc, the gas and the dust that is mixed in it eventually form into a set of planets orbiting the new star. Once the star is shining, it produces a powerful ‘wind’ of hot gas that forces its way outwards in opposite directions, above and below the disc. This wind drives away most of the original gas cloud that hides the star from view. Now we can see the young stars with an ordinary telescope. They light up the final tatters of gas from the original cloud, making it glow as a bright nebula. Nebulae, each surrounding a "nursery" of young stars, form some of the most beautiful sights in the sky. Most famous is the Orion Nebula M42 which you can spot from Europe with the naked eye during the winter months, as a misty patch below the stars of the belt in the constellation of the mighty hunter. When a star is born, it is a ball of hot gases, composed mainly of hydrogen. It shines because nuclear reactions at its centre are turning hydrogen into helium. To this extent, all new-born stars are the same. The main thing that marks out one star from another is its mass, the amount of matter it contains. The mass of a star is fixed a its birth and it determines both a star’s lifetime and its ultimate fate. The way a star lives and dies depends mainly on its mass: heavyweight stars have shorter lives and more spectacular deaths. Our Sun is a very typical star, currently in the prime of its life and so it makes a convenient yardstick for measuring other stars. Instead of saying a star weighs 20,000 million million tonnes, for example, we can say it is as massive as 10 suns. On this scale, new born stars cover a wide range, from as light as 0.07 suns to as heavy as 100 suns. The nuclear reactions run fastest in the heaviest stars, because their centres are hottest and most compressed. So the heavier stars are the brighter stars, with hotter surfaces. We can arrange these stars in a definite sequence, called the main sequence of star types. At one end are the lightweight stars, which are much dimmer than the Sun and with a surface temperature of only 3000°C. The Sun is in the middle with a temperature of 6000°C. At the top end of the range are heavy­weight stars shining as brightly as 100,000 suns, with a surface temperature of 30,000°C or more. A star spends most of its life turning hydrogen into helium so the period of the main sequence period is really the prime of its life. The length of its life depends very critically on how heavy the star is. A heavyweight star uses up its nuclear fuel so rapidly that it soon exhausts its supplies of hydrogen. A lightweight star, even though it has a smaller supply of fuel to start with, uses it much more gradually, and so lasts for a much longer time. A star's lifetime is too long for us to appreciate easily, so again we can use the Sun as a comparison. According to theory, the Sun will spend 10,000 million years altogether as a main sequence star. The heaviest stars survive for only one-thousandth of this time. The very lightweight stars can last for a hundred times longer than the Sun. When a star like the Sun dies, it doesn't just fizzle out. Instead, it experiences a kind of "middle age spread" and expands to become a red giant about a hundred times its previous size. The reason for this behaviour is in the star's very centre, its core. Reactions here have turned the original hydrogen into helium. Like the ashes in a fire, this central region produces no energy. Nuclear reactions are still going on in a thin ‘shell’ around the helium core and calculations show that these reactions produce more energy than before. As this extra energy pushes up through the star, it makes the outer parts of the star swell up. 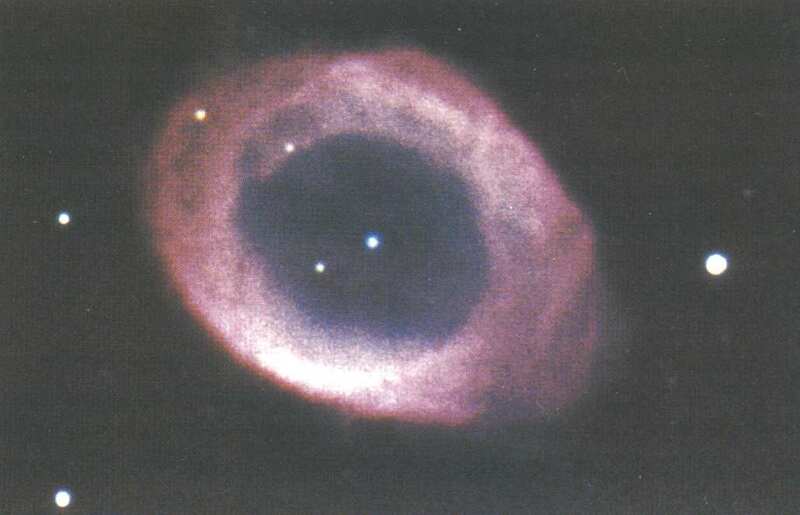 As its outer layers cool down, the star shines a red colour: hence the name "red giant". If we could cut a section through a red giant, we would find that it has a very small and dense core and a huge outer region of very thin gas-much more rarefied than the Earth's atmosphere. Compared with the main sequence stars, red giant stars are not very common; however, because they are very large they appear bright and stand out conspicuously in our skies. The most famous is Betelgeuse, in the constellation Orion; another is Antares, in Scorpio the Greek name means 'the rival of Mars’ because of its brilliant red colour. A red giant finds it difficult to hold on to its huge outer regions. The star becomes unstable and eventually the outer gas drifts off into space. Before completely disappearing, the gas forms a bubble around the dying star the effect is like a glowing smoke ring in space. Astronomers call these bubbles "planetary nebulae because they look rather like a planet when you observe them with a small telescope. After the star's outer regions have disappeared, we can see the tiny, very hot core. It is only one-hundredth the diameter of the Sun it is no larger than planet Earth and is so hot that it shines white hot. Astronomers call this a ‘white dwarf’. Because white dwarfs are very small, they appear as a rather dim object in the sky and thus are difficult to find. Astronomers have been highly success­ful in tracking down white dwarfs when they are a companion to another star. The first to be discovered was the companion to Sirius, the brightest star in the sky. Because Sirius is known as the Dog Star, its small companion is often called ‘the Pup’. A white dwarf is no longer producing any energy. It shines merely because it began life so hot. As time passes, it gradu­ally cools down, fading through yellow, orange and red, until, like a dying ember in a fire, it fades from sight altogether. A heavyweight star has a much more dramatic end as astronomers in the southern hemisphere saw in 1987. 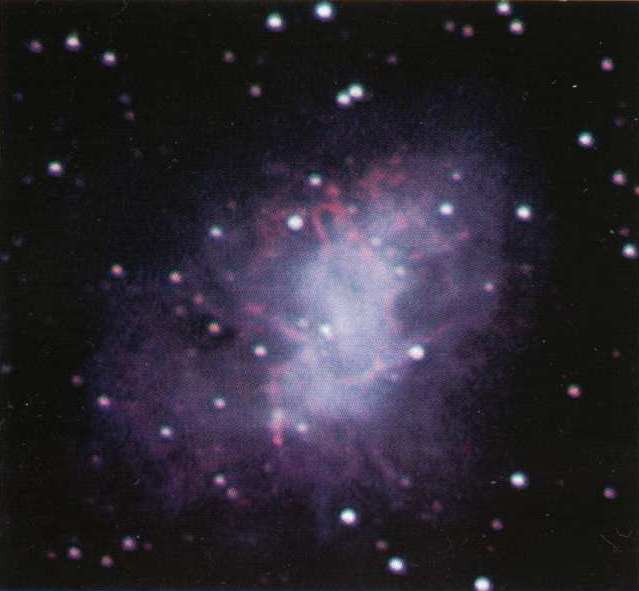 A star previously visible only through a powerful telescope suddenly exploded and shone so brightly that it was easily visible to the naked eye. The star had died as a supernova. The build-up to a supernova starts after a heavy star has lived out its main sequence of life. Now that the star has used its central supplies of hydrogen, it expands to become a red giant, with a central compact core of helium. But this is not the end of the story. In the middle of such a massive star, the pressure and temperature keep on rising until helium atoms begin to fuse into a heavier element, carbon. This reaction produces extra energy to keep the star shining. Even­tually, the increasing temperature and pressure force the carbon to change to even heavier elements such as neon, silicon, and iron. At this point, the star's core is like an onion, with concentric layers (from the inside out) of iron, silicon, neon, carbon, helium and hydrogen. But the process cannot carry on indefinitely. If you try to fuse together iron nuclei, the reaction does not produce energy in fact, it takes in energy So the star's centre is now unstable. In just a few seconds, it collapses entirely. A wave of energy from the collapsing core blows the star apart, in the massive explosion of a supernova. What happens to the collapsing core of a supernova? In the 1930s, two astrono­mers working in the US, Fritz Zwicky and Walter Baade, suggested that it shrank into a small ball, smaller than a white dwarf, made entirely of the subatomic particles called neutrons. For decades, this was just a theoretical idea until one autumn day in 1967. Two radio astronomers at Cambridge, Tony Hewish and Jocelyn Bell, picked up regu­lar signals coming from the sky. They dismissed the idea that it might be "little green men" trying to contact the Earth, and realised that instead they had found some kind of natural light-house in space. The lantern of a lighthouse sends out beams of light that seem to flash as the lantern rotates. The signals picked up at Cambridge must have come from a cosmic lighthouse that was emitting beams of radio waves, and spinning about once a second. From our present knowledge, only one kind of star was small enough to spin so rapidly, a neutron star. Radio astronomers have now located hundreds of spinning neutron stars (also known as pulsars, because of their regular "pulses" of radio waves). One of them lies at the centre of the Crab Nebula, the twisted gas cloud thrown out by a supernova that exploded 900 years ago. A neutron star is only about 25 kilometers across and the material inside it is so tightly packed that a pinhead of matter from a neutron star would have a mass of a million tonnes. Its gravity is so strong that an astronaut who tried to land on its surface would be crushed and spread out to form a layer only one atom thick. White dwarfs and neutron stars may seem very bizarre, but theory predicts an even odder type of "star corpse", a black hole. If the collapsing core of a supernova is too massive (heavier than three suns), it cannot end up as a neutron star. Its own gravity is so power­ful that the core continues to shrink, until it becomes a mathe­matical point, with no size at all and an infinite density. Surrounding this point is a region a few kilometers across where gravity is so strong that nothing can escape, not even light. This region is a black hole. It is "black" because it does not let light escape; and even if you tried to illuminate it, the hole would swallow up the beam from your torch. It is a "hole" because anything you throw into it can never emerge again, however powerful the rocket engines you might strap to it. As with neutron stars, astronomers first pre­dicted black holes in the 1930s. Only in the past few years have they found some evidence for them. In the constellation Cygnus (the swan), there is a powerful source of X-rays, named Cyg X-1. Astronomers have found a star at this point in the sky. The star itself is quite ordinary, and cannot be producing the X-rays. But it is not on its own. It is swinging around a companion star that is invisible in ordinary telescopes. By observing the visible star carefully, astronomers found that the invisible companion was exerting the gravitational pull of an object as heavy as 10 suns. This is much too heavy to be a neutron star so the only possibility is that it is a black hole. Supernovae do not represent just death and destruction. The blast from a supernova sweeps up the gases in space, compressing them into dense clouds. Here gravity can get to work, making the gas clouds shrink and condense into a new star. So a star is like a phoenix the death of a star as a supernova can trigger off the birth of a new generation of stars. When a star dies as a planetary nebula or a supernova it seeds space with the new elements that it has created during its lifetime or in its death throes elements such as carbon, iron, gold and even uranium and other radioactive elements. So the newly born stars will contain slightly less hydrogen, and rather more of these exotic elements. Astronomers now believe that when the Universe began, in the big bang, the gases consisted almost entirely of hydrogen and helium. Dying stars have formed all the other elements, including the silicon, oxygen and iron that form the Earth, and the carbon and other elements in our bodies. We owe our very existence to the life and death of countless past generations of stars. Our knowledge of other stars gives us a means of predicting the fate of the star that is most important to us the Sun. A comparison with other stars with the same mass, tells us that the Sun is a main sequence star shining because it is turning hydrogen into helium at its centre. The Sun was born about 5000 million years ago and it is predict that it has enough hydrogen to carry on much as it is for another 5000 million years. Then it will begin to swell. As the Sun turns into a red giant it will swallow up Mercury and then Venus. The bloated Sun will boil away the Earth’s oceans destroying any life that has not fled to another planetary system then the Sun will engulf the Earth itself eventually, the Sun’s outer layers will puff away as a beautiful planetary nebula, leaving a white dwarf at the centre of what is left of the Solar System circled forlornly by the charred remnants of it’s remaining planets.